For Data Science Masters of Science students, the final phase of their education is the Graduate Qualifying Project (GQP). This practicum provides students with a strong capstone experience in which to integrate theory and practice as they apply their data science and analytics skills. With the support of WPI’s distinguished Data Science faculty, students tackle a real- world problem sponsored by a business or organization. WPI’s Executive Advisory Board prioritizes industry partnerships with exceptional corporations, both regionally and internationally. They and our other top executives are imperative to helping drive the success of our program and to meeting the needs of corporate America, particularly in conjunction with our sponsored GQPs, which give students the opportunity to work on real-world problems for the businesses with whom they collaborate, such as IBM, EnerNoc, and IOMICS. 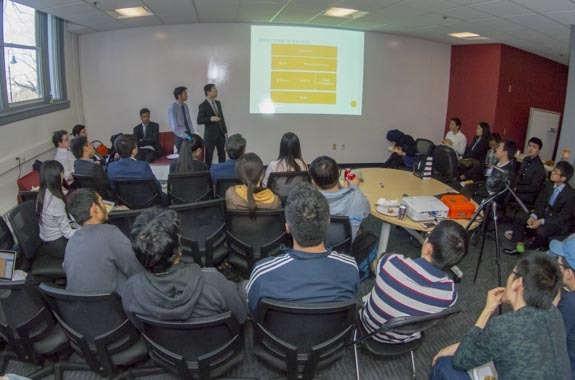 A team of 3-4 Data Science graduate students works under the terms of a mutually beneficial agreement between the corporate sponsor and WPI. The sponsor specifies a challenging business problem and provides data for the students to analyze. Students are expert in a variety of skills and professional experience and each team is adept in statistics, data cleaning, data modeling and visualization, computer programming, and with using industry-standard analytical software tools.. Students also receive instruction in teamwork, project management and communication skills. The Graduate Qualifying Projects contribute to cutting-edge data science STEM programs through innovative project-based education that bridges the gap between educational training and industry. Please contact Elke Rundensteiner, Director of Data Science at rundenst@wpi.edu or by calling 508-831-5815. If you are ready to submit a Project Proposal online, please review and submit the Project Inquiry Form. WPI’s long history of industry partnerships is the keystone of the Data Science program. We invest heavily in our Graduate Qualifying Project, the capstone where students use data analysis to deliver strategic business decisions in real time.